A Cumbrian school bus involved in a crash which killed a man and two teenagers was on the correct side of the road on impact, police have said. Investigations suggested the bus swerved to avoid an oncoming car which had crossed the central line on Monday, Cumbria Police said in a statement. Kieran Goulding, 15, and Chloe Walker, 16, were both killed. Chloe was marking her birthday. Patrick Short, 68, who was driving a Honda Civic car, was also killed. Nine children remain in hospital, two in a serious condition, after the 49-seater transporting pupils from Keswick School crashed on the A66 on Monday. Police said 25 other people were treated for injuries, most of them children. Their injuries ranged from cuts to fractures and spinal injuries. 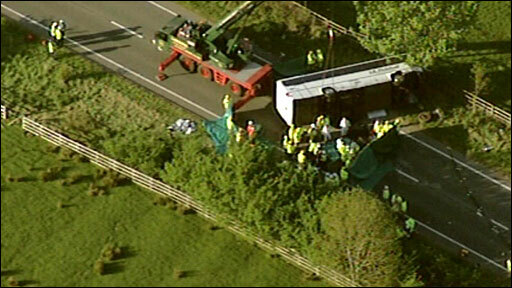 The coach driver, a 63-year-old man from Egremont who worked for JB Pickthall in Rowrah, west Cumbria, is in a stable condition in hospital. Police said children from the same school who were travelling on a minibus behind the coach rushed to help their classmates. 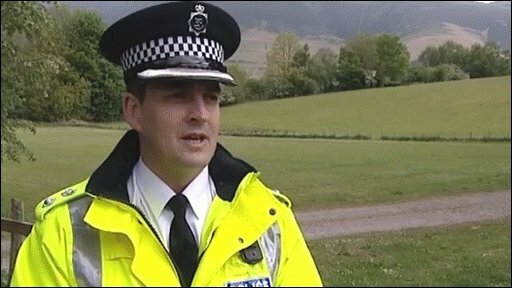 Ch Supt Steve Johnson praised their actions. He said: "They went straight to the aid of their friends and colleagues and did an incredible job." Chloe Walker's brother Jordan died in April 2007 from the degenerative condition Sanfilippo syndrome, which was diagnosed when he was seven years old. Keswick School head teacher Michael Chapman said of the family's double loss: "I cannot begin to describe how I would feel in those circumstances." Mr Short was a "generous, principled man"
Speaking of the teenagers who died, Mr Chapman said: "All I can say is they were Keswick School children and that makes them the most wonderful children in the world." Educational psychologists have gone into the school, which has about 1,000 pupils aged between 11 and 18, to offer support. Tributes were also paid to the car driver killed in the crash - Patrick Short, from Braithwaite. His wife Wendy described him as a "generous, principled man". 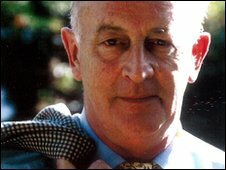 "He loved me and the family and was committed to his work with Barnardo's. As a parish councillor, chairman of Cumbria Rural Choirs and a former church warden, he was dedicated to the local community," she said. The A66 was closed until 0300 BST on Tuesday to allow an investigation of the crash scene. Police urged people not to attempt to leave floral tributes at the crash scene. Crosthwaite church in Keswick and nearby Braithwaite church opened to receive flowers.